Dream In Darkness: Still Time to Enter and Sponsor Info! There is still time to enter August's challenge, remember you have the entire month to get in so got a last minute creep you want to let out? Then you know where to let it out at! Thanks for all the awesome entries this month so far, we are loving it! Now for sponsor information: there is no sponsor so you know what that means? Let the craziness begin with team Dream in Darkness! But wait...no wailing or gnashing of teeth, there will be an amazing, wonderful, fantastic, awesome, well you get the point, PRIZE anyway! Two of our wondermous creative team members have donated some duplicates from their stashes of rubber, yes, rubber stamps and as of now the prize has totaled up past 15 dollars worth of stamps from VivaLasVegaStamps! and Rubber Bandit stamps! We want to enter ourselves for this booty of treasure, which brings us to our 3rd point. September is Pirate Month! Well, since Talk Like a Pirate day occurs during September we are declaring it Pirate Month! 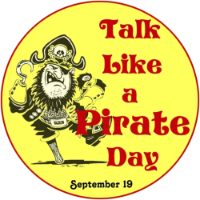 Yes, on September the 19th if you go to certain fast food places like Krispy Kreme and Long John Silvers on Speak Like a Pirate Day and you actually order like a pirate you get an item free. How fun is that? So the theme is still Anything Goes but we wanted to take a moment to remember our friends the pirates! What awesome creepy crawly makes they do give us! So, summary: still time to enter, FANTASTICAL PRIZE for September, and Pirate Month is September! Do we need to say more to entice you to get busy for those entries for September? We thought not! Latest news update on Evil Froggy on September 1st, if you have been following the plight of CT Nan, you have a shock in store for you! Not another word more, our lawyers have advised us to speak no more until the first. Plus, there are eyes everywhere and we have found 2 ears..just eyes and ears! Talk about making you think twice?? The house IS in quiet a state of turmoil at the moment which only makes us more eager to make some twisted, other worldly makes for you! And that squeak in the floor is definitely something...but we feel almost 79% sure you are safe to enter the house and add your makes. Hey, not bad odds don't ya think? Buwahahahaha! Shiver me timbers!!!! Crrram on all sails, let's speed into September Me hearrrrties, I'm heading for the cask of rum harr harr. But I promise only to tiptoe through the tulips that are budding now.